Good weather and good timing have allowed me to photograph the rare and endangered piping plover chicks. 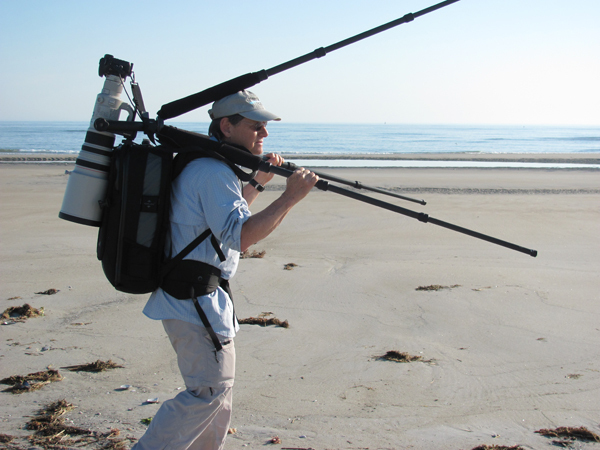 These birds nest on a few beaches on the east coast. One very well known area is Plum Island in Newburyport, Massachusetts. Unfortunately, most of the areas on Plum Island are chained off to the public to protect the nesting plovers (the one area that is accessible is Sandy Point at the tip of the island, where less restrictive fences are used). A much better place that is more open is Crane Beach in Ipswich. However, it’s a 1-2 mile hike to the nesting areas (then back). 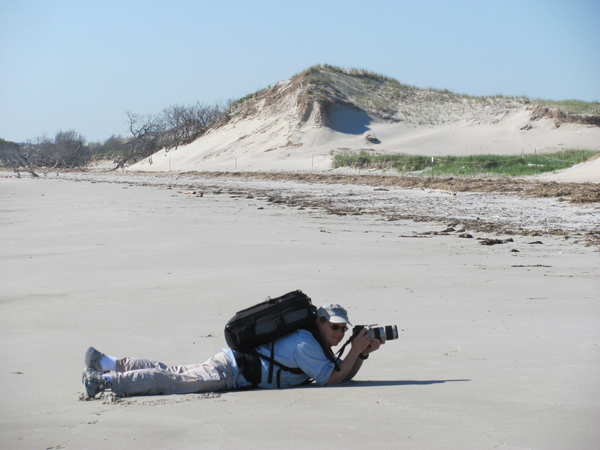 Carrying a full load of camera gear, tripod and my 500mm lens can make for an exhausting morning – but the exhilaration of watching and photographing the plover chicks more than makes up for it. The chicks are very cute. They look like a puff ball with legs and a beak. 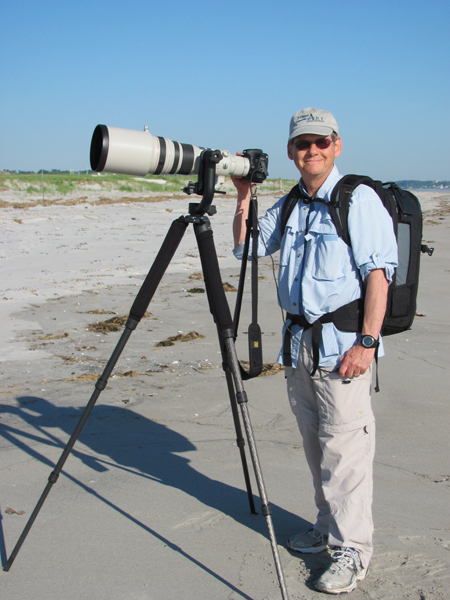 Bill Gette, director of the Mass Audubon Joppa Flats Education Center in Newburyport, described them as “looking like something that dropped out of your vacuum cleaner, except with spindly legs and a beak”. The plovers make their nest in the dune grass, where they are hidden and protected by a symbolic fence. Within hours of hatching the chicks are on the run, and they can scurry about at speeds that make it a challenge to follow them by camera. The parents teach them to forage for insects and small crustaceans. As a family group they will tentatively and (as it seems) randomly work their way across the beach to the wet sand where they dig for their meals. When danger lurks-or just to keep warm-the chicks will crawl and huddle under mother plover. How many chicks are there under mother plover? Watch this video to see how many chicks fit under the tent. Occasionally a chick will come out from under to allow room for a sibling. I am happy to say that the plovers are doing well this season, with many nests and healthy looking families. They seem to be proliferating. ~ by richardseeley on June 13, 2011. What a great addition to your mother-and-children series! As always, I look forward to your blog, new pictures, etc. Cam and I wish you and Beth the best. It’s been a couple years since we’ve enjoyed each others company and look forward to a night of good food and conversation when you returned to the “county”. BTW, it snowed last night, June 19th, say what? I guess I’m not surprised. C’est très difficile de trouver une place. La maison est trop petite. I thourghly enjoyed your pictures and so glad you spent the effort to get them. I am sure it was a great pleasure to you to catch them and seeing them doing well. I meet Carol and her daughter on a Riverboat cruise about 6 years ago and we have kept in touch. She is a lovely person and I hope to get to see her this fall. Richard, I love your work. Always something interesting, new and exciting on your site ! You are a very very talented photographer !